HOOKWOOD, as its name suggests, developed on a heavily wooded area like Glovers and St Edolphs Woods in Charlwood. These woods are believed to have been there since Saxon times and contain some very rare specimens. Not surprisingly, iron smelting became the main industry during the middle ages. The wood was used to fuel furnaces and build houses. Charcoal, which was used a great deal, was also produced. Most of the other employment came from farming and tanning. Povey Cross House in the Reigate Road dates from this time and was once an Iron Master’s home. Several of the half dozen or so timber framed houses that still exist in Hookwood were probably farm houses or Manor houses, Hookwood Manor which has a minstrels’ gallery is a good example. Hops House, where the Hookwood Windmill was sited, Woodlands Farm and Hunters Moon are very ancient buildings. During the 1700s very little building took place in Hookwood as the soil was poor and the area economically depressed. In 1755 a tollgate was attached to the old Black Horse Inn at the top of Horse Hills. However, when Brighton became popular the road was improved and a new Black Horse was built at the bottom of the hill and the tollgate removed to there. 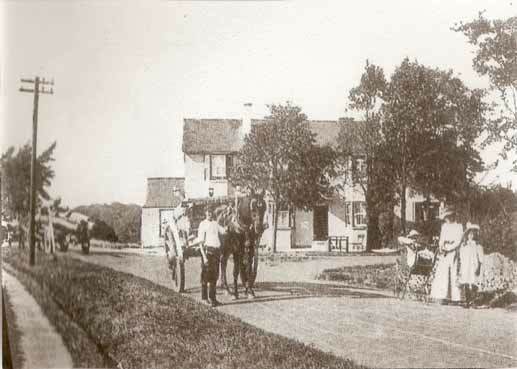 Reigate Road, Hookwood, formerly known as Hookwood Common Road, was the route that the Prince Regent took when travelling from London to Brighton and the “new” Black Horse was built by the roadside for this traveller and his entourage. The middle part of the present building is the original construction. Star Cottage was an Ale House - it lies along the old road at the back of the existing road on the old Hookwood Common (in the 1900s the lady living there took in orphans). This is a timber framed cottage which boasts connections with Povey, the Highwayman who “worked” locally and is believed to have been hanged at Povey Cross. At that time Hookwood was little more than a hamlet of scattered cottages nestling along the River Mole – broken up by all the little streams which flowed into it. The road ran through Hookwood Common. 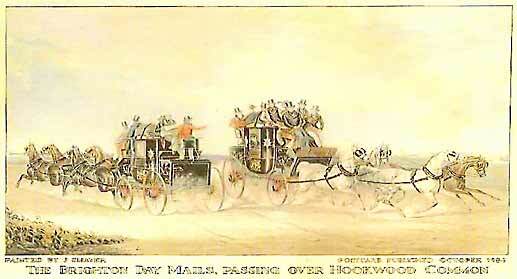 The Gatwick Racecourse was adjacent the village and the ladies of Hookwood supplied the teas on race days. Horses and dogs were raced at the racecourse which was closed in 1937, although there was still a Racing Stable and a farm working there until 1956. In the 50s the old Racecourse Bandstand was moved to Queens Square in Crawley New Town. The land next to the racecourse was developed as the Gatwick Aerodrome, which was licenced in 1930; the Beehive terminal building opened in 1936 but the aerodrome was obsolete by the 50s – during this time the course of the Mole was diverted. After the first world war ‘plots’ were bought in Hookwood and quite a few people had smallholdings and nurseries, or worked in the brick works (where Tesco now stands). The Victorians built several large houses in Hookwood, amongst them Ferriers Court and Hookwood Lodge. They also began to build smaller cottages along the Reigate Road and Povey Cross Road, and the village developed with its own Post Office/General Stores in the Reigate Road, Langmore Stores at the entrance to Brickyard Lane and a General Stores/Butchers run by the Tizzards in Povey Cross Road, with a further store in Mill Lane referred to by the locals as ‘Lemons’. By the 70s all these shops had closed and been converted into housing. 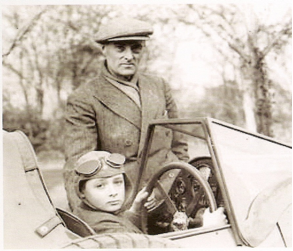 During the war in 1940 there was a raid by a German bomber on the Depot in Hookwood which housed a NAFFI, a Petrol Store, AA/searchlight workshop and general RAOC store – only one man was killed but extensive damage was caused and the pilot machined-gunned the village as he flew away – it is reported that he later crashed. An incendiary bomb landed beside Tizzard’s in Povey Cross Road and a big machine gun was sited in the field between Hookwood Farm and The Black Horse. The depot site, opposite Kennel Lane, is now small industrial units and the houses to the left of this entrance were the three police houses, the largest being the Sergeant’s house – sold long ago on the open market. After the war at the time when cycling became popular some of the houses provided refreshments for passing cyclists. Melrose Farm was a poultry farm and had Nissan huts in which the owner, Mrs Hodgkinson, put cyclists up for the night. Around 1966 a very nasty murder took place in one of the houses in the village, which greatly shocked the local residents. Reigate Road, Hookwood Hookwood had had strong links with Lowfield Heath before the A217 was re-routed to join the A27 at Longbridge instead of Povey Cross and with the development of the Airport many houses south of Povey Cross were demolished and the road bisected by the runway. Although most of the houses in Lowfield Heath were demolished, the church still exists and at present is leased to an Evangelical congregation. The Lowfield Heath windmill was dismantled and resited in Charlwood at the bottom of Russ Hill. The continued expansion of Gatwick Airport ate into the countryside on the South and the expansion of Horley in the sixties to the East, and Hookwood continued to grow. The old brick works were sold to Hoovers in the sixties who built their distribution depot there, and this was subsequently sold to Tesco. There had been a large lake at the rear of the Brickyard, enjoyed by the local residents, but this was filled in when Tesco bought the land and is now under their car park. The Withey estate was built with starter homes and was ideal accommodation for a growing community – the latest development in Hookwood was Mistley Gardens in 2004. The community continually alters – young families move in as properties become available or starter homes are built, but Hookwood is a place people tend to stay and there are residents over the whole age range. In the early 60s there was a thriving Play Group, started by local mothers, a well-attended Womens’ Institute, a thriving Residents’ Association and a popular village hall. The hall has been replaced and is well used but the Play Group, WI and Resident’s Association have disbanded. 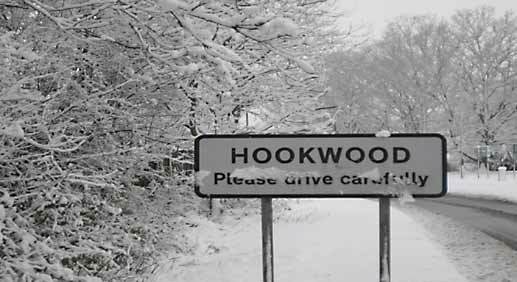 However, there are many young families in Hookwood and a strong feeling of community. The local hall is used by many groups, including Horley Bridge Club, Taekwondo, Kickboxing, Zumba, Yoga, and local events and family parties; it is hoped in time to start a Youth Club. As an offshoot of the Charlwood and Hookwood Community Plan, “Hello Hookwood” was formed to raise community spirit in Hookwood and has run two very successful “Fun Days”. It is hoped that the Association will grow and involve more local residents in staging their events. Hookwood still has countryside walks and footpaths taking you away from the major roads. 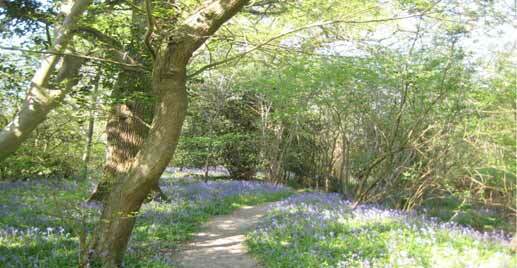 It is possible to walk along the river to Charlwood and in the Spring there are bluebells and orchids in the woods.